Wow, NaNo was such a positive experience for me! Confession: I was in a little bit of a writing rut before November. After having a baby in July, I had a hard time getting back into the swing of things. 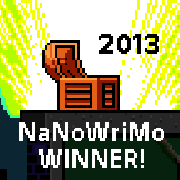 It was starting to get to me, and that was why I decided to do NaNo. Previously, the most I have ever written in a month was maybe 25K words, so I wasn't sure I could actually reach 50K. But why not try? I'm so glad I did! Since I ended up not writing at all for 9 days while traveling, I had to make up for it by writing 3500+ words on some days. Increasing your word counts is like exercise: you have to build up to it. The first day, I was exhausted after only writing 19K. I had no idea how I would keep it up! But once I started flexing those muscles, I got better at it. I learned how to really let go and not over-think each scene. Instead, it was very much free writing for me, a way to let my creativity flow. Since I'm a discovery writer or pantser or whatever you want to call it, this was really a great exercise to discover my story. By the end of the manuscript, I had dropped several things from the beginning that were red herrings. I still haven't quite figured out how the ending should go, but I have some good ideas.